Blackberries 2 – the workshop version. We had a nice time at the last studio workshop of the year, Margaret, Barbara, Kathy, Jean, Ian, Megan, Greta, Lynne and I. 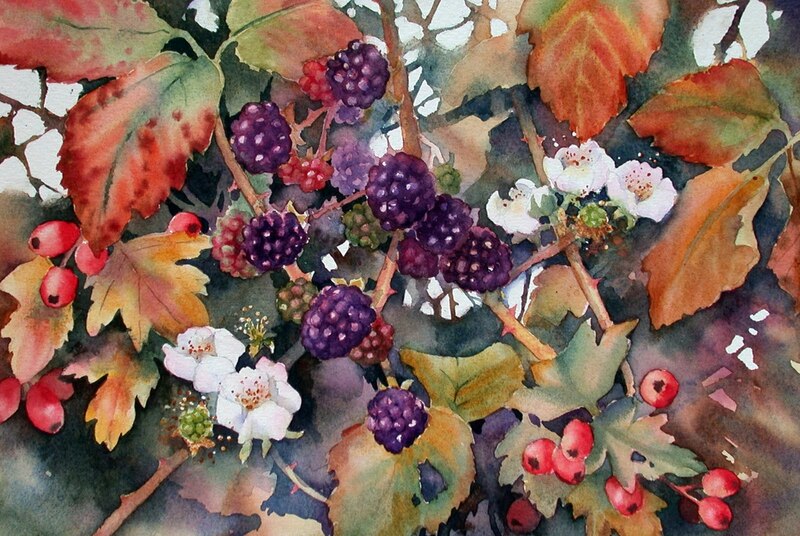 The hedgerow blackberries and hawthorn gave us a complicated subject but with lots of interest, including as it did, flowers, fruits, leaves, background, texture and so on. There were some brilliant paintings at the end and I was so excited, I forgot to take any photos! My second version of the blackberries has more light in it with some “skyholes” and more of the white blackberry flowers lifting the composition. It was quite sad to say goodbye to everyone. I want to thank everyone who has come to any of my studio workshops. We have run 40 workshops since 2006 when I first got my lovely premises built thanks to the belief and generosity of my husband Andrew. He has also provided the delicious lunches that have sustained us through many hours of concentration and hard creative work. So thanks, partner! Next Next post: Woke up to Snow!